The compartment lid lock is located directly below the rear compartment ornament. 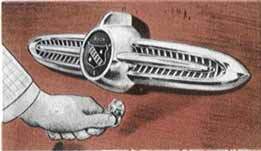 Insert and turn the key and raise the compartment lid, using lower edge of ornament as a handle. To lock, firmly close lid. 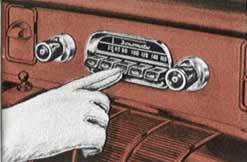 Switch and Volume Control (left Knob) - The first portion of rotation is a clockwise direction turns on the radio. Further rotation increases volume. Tone Control (Chrome Plated Lever Behind the Volume Control Knob) - Control in extreme "treble" position gives brilliant reproduction of the full tone range. This position will reproduce speech very clearly and distinctly. Rotation counterclockwise (toward "bass") diminishes brilliance and accentuates low notes. Tuning Control (Right Knob) - When tuning manually, or when setting up a station on one of the buttons, remember - If the program sounds shrill or distorted, it is probably caused by improper tuning and can be corrected by adjusting the tuning knob slightly. Since the low notes are more affected by tuning than the high tones, it is a good plan to tune the set to a point where the low notes are heard best and the high notes are clear but not shrill. Press button to right and at the same time pull it out as far as possible. Push button as far as possible. This automatically completes the button set-up and locks the mechanism in position.